Roofing is all about getting things right the first time. To do this, consider hiring an expert like Santex Roofing to assist you with the process. Our hot tar (modified Bitumen) roofers have been in the business for many years and have the experience needed to install the roof of your choice. We install proper roof finishing’s for commercial buildings like hospitals, educational institutions and churches among others. Our hot tar roofs are advantageous over other common roofs for many reasons you may not be aware of. With this kind of roofing, you will enjoy reduced energy costs and even do away with the adverse effects of ultraviolet radiation. 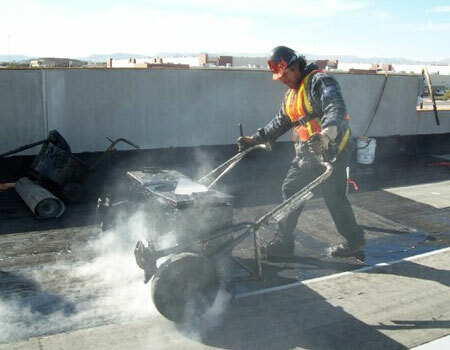 Hot tar roofs are made with special tools and use a technique consisting of waterproof materials. This makes it not only strong, but also durable. Contact us today to have your hot tar/modified bitumen roof installed for your commercial building by our highly trained workforce. Here are a few merits to convince you why you are missing out on this highly effective roofing structure. Layers of hot tar used in this roofing technique act as a barrier, preventing loss of heat from the building. This generally keeps your premises warm and cuts down on HVAC energy expenses. Once installed, hot tar roofing lasts many decades. This translates to minimal or zero maintenance and less money out of your pocket long term. You will, therefore, have ample time to channel your funds to more pressing issues other than the roof. Once we install this durable roof for you, you never have to worry about wind or moisture destroying your roof. During the installation, hot tar is used and spread evenly to help keep the layers intact. With the smooth surface on the roof, water flows away and molds have no favorable conditions to flourish, giving you a quality roof for your money. Contact Santex Roofing today and have our experts install the best roof for you today!